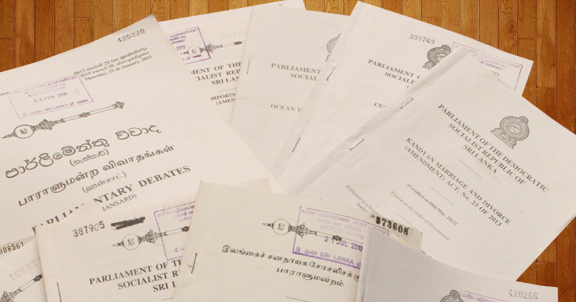 This collection includes publications such as Bills, Acts, Ordinances, Parliamentary Debates (Hanzards), Sessional Papers, Parliamentary Series, Gazettes, Sri Lanka Law Reports, New Law Reports, Administration Reports, Annual Reports, Commission Reports, Technical Reports, Research Reports, Census Reports, Statistical Reports, Hand Books, Guide Books, Directories, Commission Reports, Project Reports, Blue Books, Circulars, etc. published on Sri Lanka by various Institutions. These institutions are Presidential Secretariat, Parliament, General Treasury, Ministries, Departments, Corporations, Statutory Boards, National Institutions, Institutions connected to Local Government, state Banks, Limited Liability Companies etc. Government publications are acquired through deposits, purchases and donations.